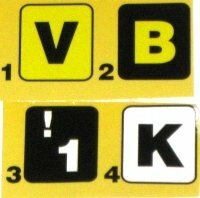 This huge extra bold keyboard stickers come in four different color combinations: black on white, white on black, black on yellow and yellow on black. Whatever you prefer, you can easily turn your old keyboard with small keys into one that is easy to read and type on. These keyboard stickers are compatible with PC, Mac, netbooks and laptops. They are easily attached and ideal for children, people with special needs, those with impaired sight or anyone who otherwise has trouble typing. You don’t need to buy another keyboard, and these stickers are really cheap, so check them out below. This keyboard is perfect for elderly people and those with impaired sight. 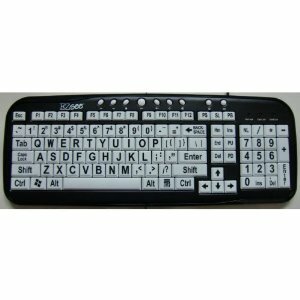 It’s a black keyboard with large white printed letters that you simply can’t miss. If you’re having a hard time seeing the keys, this EZsee keyboard by DC will surely help you with that. This Large Print Keyboard has been designed specifically for those with conditions that cause visual impairment or low vision, such as macular degeneration, glaucoma, diabetic retinopathy, and cataracts. These large print, large key keyboards are perfect for anyone who has a hard time seeing the existing commands on their keyboards. 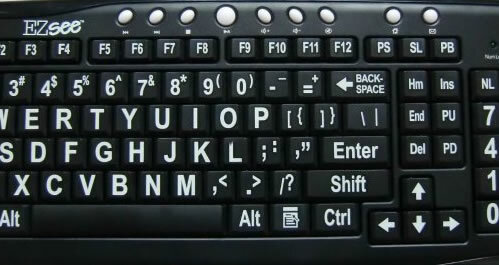 Youll benefit from more accurate keystrokes, making your time spent on the computer more efficient and enjoyable. With a bigger and bolder black typeface on vividly bright yellow keys, the keys are easier to see. Additional keys (hot keys) have been added to the keyboard to allow for easier access to commonly used commands such as searching and accessing e-mail and the Internet, plus the energy-saving keys wake and sleep for when you dont want to shut down entirely. You can also get this same keyboard in white colored keys and the letters printed in black if you need even more contrast. Additionally one is also available with yellow keys. These keyboards are highly endurable and really cheap, so if you’re looking to spend as little as possible and get a great keyboard you will use for years this is a great choice.